The Visual Science Lab / Kirk Tuck: A guest post about LED lighting by VSL reader, Joe Gilbert. A guest post about LED lighting by VSL reader, Joe Gilbert. All images ©Joe Gilbert, All rights reserved. My name is Joe Gilbert; I live in Baton Rouge and have been a VSL reader for a long time. Kirk recently asked if I would be interested in sharing some of my work and techniques, so a brief introduction and look at how this came to be is in order. My interests lie on a fine edge between professional work, and photography as an avocation. I’m self-employed, and work on behalf of several insurance companies. When a “red flag” prompts them to dig a little deeper into a routine claim, or when defense counsel needs assistance defending a large liability claim, they call me. My two priorities are garnering cooperation, and accurately documenting my findings. Kirk does this and creates art, I do it and create a body of evidence; both tell a story. From photographing scrapes under an 18-wheeler that ran over a go-kart, to photographing an industrial fish-skinning machine that was used with catastrophic consequences; proper lighting and an accurate perspective are critical. I closed my small portrait studio about 10 years; however, I kept a couple of Photogenic PL1250 monolights and on occasion would set them up for fun. I sold them about two years ago and had been shooting a lot of natural light portraits for fun. Even on their lowest setting, 500ws moonlights are too powerful for shooting with a large aperture in confined spaces. I became interested in LED lighting while watching Kirk artfully exploit the technology and his subsequent sharing of what worked, and what didn’t. Eventually, I realized the technology was a fit for me professionally and artistically. Other than a slight green color cast from the Fotodiox Pro LED 312AS, I really can’t think of a downside to that light. I don’t consider the lack of power to be a downside. I purchased the Fotodiox 312AS several months ago, and the Fiilex P360 in July. The Fiilex P360 was a game changer for me; it consumes very little power, and provides a nice hard light for dramatic portraiture. With the addition an umbrella, soft box or other diffusion device, it creates a wonderfully soft light. The quality of light from the Fiilex is beyond beautiful and is noticeably cleaner than other LED lights I’ve seen. The adjustable color temperature of both lights makes them a perfect fit for blending with available light, whether natural or artificial. I Put together a small lighting travel pack consisting of the two LED lights, a Sony HVL-F58 flash, white balance card, an incident & flash light meter, extra batteries, and a Fresnel lens and barn door rig. A couple of light stands and an umbrella stuffed in the carry bag that came with a cheap camping chair from Wal-Mart, and a 5 in 1 reflector & stand round out a kit that can handle most of my challenges. I met Kirk in April of this year at the Blanton Museum of Art. We chatted and enjoyed inexpensive wine before listening to an inspiring lecture by Sylvia Plachy. After meeting Kirk in person, I’ve become an even greater fan and have since shared an occasional thought and a few photos with him. I enrolled in his online Portrait Studio Class as soon as I saw the announcement, and am extremely happy that I did. I think most everyone would enjoy his amiable personality, and even experienced photographers are bound to learn something valuable. Not only did I learn a lot; the course inspired me to do better. I was genuinely excited to put together a shoot and see the results! Kirk often emphasizes the importance of interacting with the model, and speaks about color accuracy and doing a custom camera calibration in the online course. Both points are super-important, and critically linked for me. I make a point to patronize local stores, coffee shops, and restaurants. This is how I find my models. Most people are lost when it comes to sitting in front of a camera, so I hand the model a WhiBal grey card and a Gossen Digipro F incident & flash meter to involve them in the process. The simple act of involving them in the process, explaining the color of light, and the importance of measuring the light falling on them creates dialogue with even the shyest of subjects. The Digipro F can be operated with one hand and is so simple that it only takes a few seconds to explain the process and show the model how to operate the meter. I am having great personal success blending the LED light with lamps, natural light, and even light from computer monitors. Setting the color temperature on the Fotodiox 312 to match the ambient color resulted in nice clean photographs, but lacked the punch I wanted. I’d like to share some of my recent portraits taken with the addition of the Fiilex, and a few done after completing Kirk’s Portrait Studio Course. Although I shoot aperture priority and dial in appropriate exposure compensation while out and about, I generally like to meter and expose for the highlights when working with a model. I let the shadows fall as they may. Conversely, there are times when I need to meter on a specific area for evidentiary use and I don’t care if other parts of the photo are blown or blocked. When setting up my lighting I’ve found that squinting drops the shadows and highlights to a point that pretty accurately reflects what the camera will capture. This helps me visualize the end result and adjust the light as needed. I also use several different cameras with EVFs and that also makes it a little easier to visualize. We then moved inside a cabin on the same property and utilized the Fiilex with an umbrella as key light, and the Fotodiox 312 for some separation. I experimented shooting through, and bouncing off a Photoflex 45” convertible umbrella. I can’t remember what I ended up doing with this photograph of Victoria in the cabin. Remember me saying that I did not consider the low power of LED lighting to be a downside? The limited power, comparatively speaking, of the LED lighting and an understanding of the inverse square law gives us the opportunity to get very close to the subject. As Kirk reminds us in the course, the closer light is to a subject, the larger and softer the light appears. Working with light so close to the model, the light drops three stops a very short distance past the model, allowing for virtually unlimited creativity in a small space. I inflated the bottom half of the pool on the rear porch, covered the bottom with black cloth, and tossed in a few silk flowers and shiny rocks. (Next time I will use black plastic, as I had to skim a lot of lint from the water surface.) We filled the pool with about 6” of water, and setup the lighting. Kirk mentions that 45 degrees up, and 45 degrees to the side is a great starting point for your key light, and I find it to be very true. 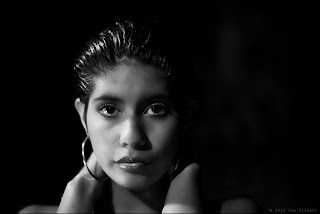 I used the Fiilex P360 as key light, and placed it to the model’s left side. I found the unmodified light too hard for what I had envisioned, and found that bouncing the light from a Photoflex 45” convertible umbrella created a very nice light. (Take note that placing the Fresnel over the Fiilex actually reduces the output reflected from the umbrella.) The umbrella was approximately five feet from the models face, and I was able to shoot at ISO 800 f2 1/60th. A perfectly fine amount of light for a portrait with the Sony Alpha 900, Zeiss 85mm lens and Image stabilization on. I set the Fotodiox 312 at the models feet on her right side and kept the exposure value the same to create some depth to the portrait. An assistant handled the Interfit 5 in 1 reflector. Using the silver side, he moved in and out as Brooke posed to provide fill for her right side. This final shot of Stella seated in the pool was done with her looking toward the key light, and again an assistant was using the silver reflector to provide fill for her left side, camera right. Shot with the Sony Alpha 900 and Zeiss 85mm at ISO 400 f1.4 1/60th. The Fotodiox 312 was two stops brighter, at f2.8 to give some bang to a very sweet feeling pose. Overall my experience with LED lighting has been positive, and the Portrait Studio Class was both enjoyable and educational. Highly recommended! Wonderful control and blending of light. Thank you for sharing this with us. Thank you Glenn and Bruce. These lights really are fun to use. Kirk has several posts about LED lighting that you can find here with the search feature. Also his LED lighting book is available. Kirk's earlier posts about LED lighting inspired my purchases. 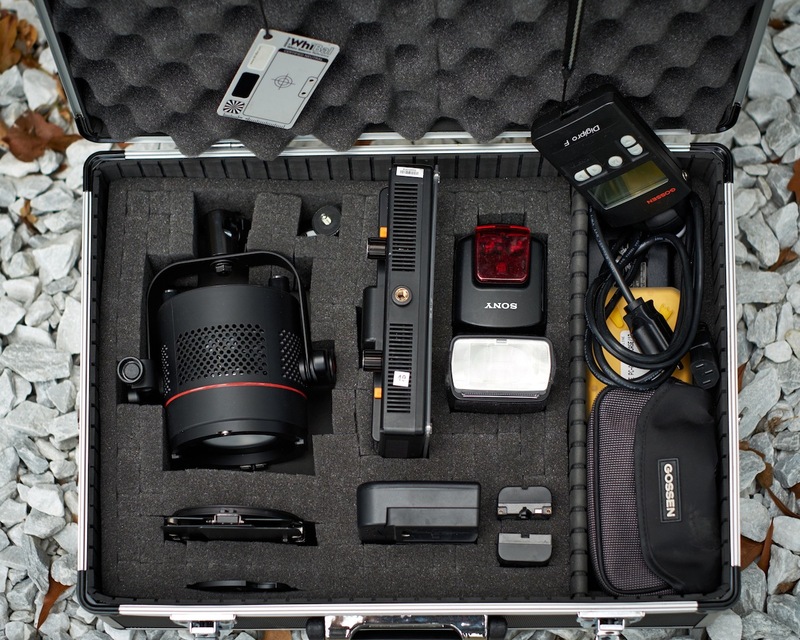 Excellent detailed post I wish I had your lighting travel pack! Thank you. I'm space challenged in my work vehicle, so it came about as a means to keep myself organized. It has turned out to be really handy. Quite an enchanting and much artistic post in regards to LED recessed ceiling lights. LED high bay light, this means maximum efficiency in a large storage space or cooling may be covered with as few lights completely. Led bulbs happen to be the best creation in the lighting industry. This is because they have many advantages that make them very appealing. One of the advantages is that they are durable. According to the manufacturers of the bulbs, the bulbs have a lifetime of 25,000 hours which translates to 25 years. The bulbs also come in different colors and designs thus you are always spoilt of choice. The bulbs also consume just minimal amounts of power thus they save you plenty of money. The bulbs are ideal for places that require instant lighting. This is because they don’t warm up like the fluorescent bulbs. I’m glad it was useful to me. Thanks for your work. Thanks for sharing nice info about LED technology and i am also in business of LED Lights in UK named Sheer LED , supplier of online LED products. Led Light We got a couple of these to add to our band's stage lights. We use them more like accent lights. They're small and really affordable. We like them.